I finally tried Grill’d today – I always walked pass it but everytime I was either a) not in mood for burger, b) too full, c) in a hurry. I was actually quite surprised that they are opened today too – in fact quite a lot of diners are opened on Brunswick Street (for limited hours), so if everything is closed in your suburb on Easter Sunday, you may want to give the inner suburbs a shot next Easter Sunday. Anyway, I had the cheapest burger – Simply Grill’d ($7.5) which has beef, salad and mayo. I also asked for cheese for an extra 70 cents. 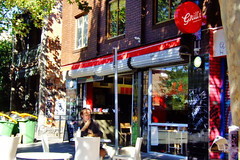 Grill’d offered four choices of bread: traditional, traditional (combination of wholemeal and white), panini, and panini (sourdough). The beef was juicy and the right amount and combination of sauce were added to the burger. The panini was toasted perfectly. It was a very pleasant burger and I’d definitely come back for more burgers later! Grill’d also offer chicken burgers however I was too hungry to pay attention if they have veggie burger, sorry vegetarians! Funny, I’ve never heard of Grill’d till this early arvo when I stepped into it after church along Bridge Road. I had the Mighty Melbourne with panini bread and chips by the side. The chips are worth a mention as well, as they are marinated in herbs. It’s salty, herby and tasty. I’m not a burger fan in general, but I love a good burger from Grill’d. I tend to frequent their Acland St outlet more, and I love their ‘Simon Says’ chicken burger. Yummo. And there’s stuff for the vegetarians too! The tofu patties are great! There was actually some controversy over the location of the Brunswick/Kerr St Grill’d. Apparently, the space between Kerr street and Brunswick was one of the few open spaces on Brunswick St. Grill’d was approved to put tables out there and I suppose some locals felt that it encroached on public space. Either way, their burgers are #1. Chips are quite good too. Herb mayo dipping sauce, can’t go wrong. I’m not too sure how healthy it is though.